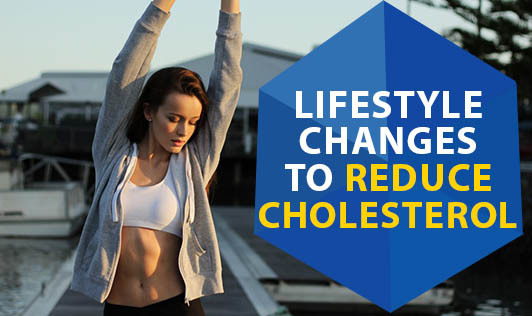 Lifestyle changes can help reduce cholesterol. Proper diet and regular exercise are key weapons in the fight against high cholesterol. Surprisingly, even many people who take medications for high cholesterol are not really been given detailed information about how they can alter their lifestyle to deal with this problem. Cholesterol levels can affect your health and may determine the risk you have for stroke or heart attack. People should have levels of total serum cholesterol that are less than 200, but a healthier goal is 160 - 180 mg/dl. Choose healthier fats - It's better to use refined oils like gingelly/ mustard/ groundnut/ sunflower/ rice bran oil for cooking. Eliminate Trans fats - Trans fat can be found in fried foods and many commercial baked products. Avoid such foods. Limit the cholesterol in your food - The most concentrated sources of cholesterol include organ meats, egg yolks and whole milk products. Use lean cuts of meat, egg whites and skim milk instead. Select whole grains - Choose whole-wheat flour, ragi, jowar, maize, whole wheat breads and brown rice. Stock up on fruits and vegetables - Fruits and vegetables are rich in dietary fiber, which can help lower cholesterol. So consume them in the diet daily. Exercise can be extremely helpful in lowering cholesterol levels. When you exercise, you raise the level of good cholesterol within the body. Walking for a minimum of 30 minutes at least 5 days a week can make a difference. Smoking has been proven to raise bad cholesterol and can reduce your good cholesterol. Smokers who have high cholesterol are at greater risk for strokes and heart attacks, so it is better to stop smoking.